Morgan James Publishing, 9781630476236, 160pp. 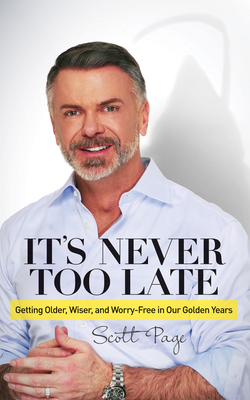 "It's Never too Late" could save (the rest of) your life. We re all going to die. Jolting, yes, but an important truth we must face because most people, when left to their own devices, choose the easier path of living in fantasy rather than reality. It's high time we come to terms with our mortality because the outlook for many of us is one of overwhelming fear and horror about the reality of growing old in America. What's worse, far too many of us are well aware of the dire forecast for our future but feel utterly powerless in its wake. But it doesn t have to be that way. Towards getting ourselves back on track or helping elder parents and loved ones do the same, Scott Page gives us easy (and even fun) ways to develop a workable plan for living out our lives with greater peace of mind and security regardless of our current age and station in life---leaving us wondering why we didn t do something about it sooner. With easy, fast-acting steps to restore hope and faith for our future, Scott offers a holistic methodology anyone is fully capable of following if they re willing to get into motion. Scott Page represents a classic entrepreneurial success story, building a pioneering insurance industry business from the ground up and helping thousands of Americans improve their financial lives. During a 25-year business career, he raised millions of dollars in investment capital from Wall Street but always with an eye on helping average citizens. He is an ongoing contributor to The Huffington Post on retirement issues and a regular guest on Fox Business Network.